It had been an awful day. The rain rarely ceased completely, a gusty wind caused an uncomfortable chill on the backbone. The perfect evening to sit at the fireplace and drink a hot tea with rum. Why had I looked at the tide predictions… But there was no excuse, a high high tide was predicted for 7.45 pm, offering one of the rare occasions to go diving at Shiprock at a reasonable time. Because of the strong tidal currents it is best to dive this spot right at high tide, any other time the visibility can be shocking (this can also happen at high tide though…) and it is not that much fun to swim against the current either. We jumped in deliberately early at 7.35 pm. And were immediately rewarded for braving the unpleasant weather – after dropping down the wall to 15m the visibility was well beyond 10m, extraordinary for this site. Most of the time we didn’t notice though, as we were having a close look at the wall for little critters. I spent most of the hour in the water trying to become friends with a cuttle fish and to get some good shots of it. 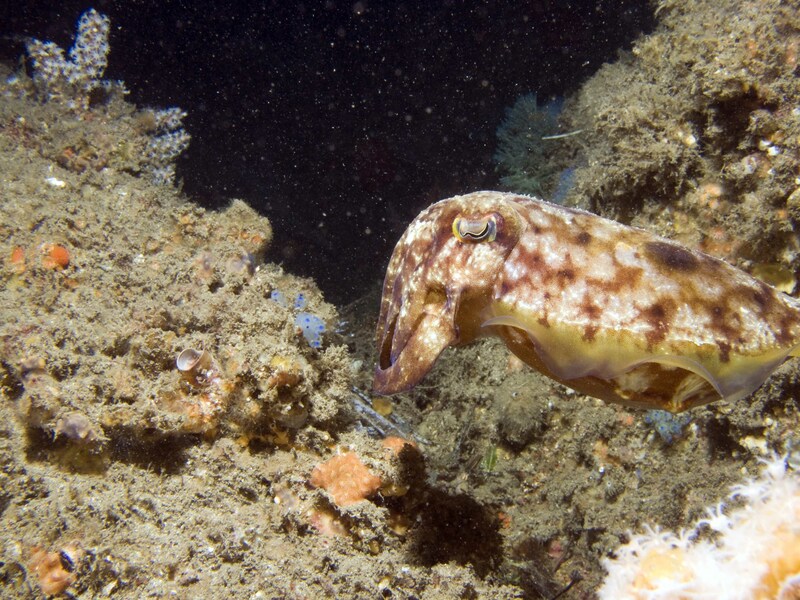 The highlight of the dive was another cuttle fish, if one can call it already like that. I found a baby cuttle of merely 2cm length. It was barely able to swim yet and looked very cute in its up and down motions with only little horizontal movement. I had to realise that I don’t know my equipment well enough yet. Finding the right buttons on the back of the strobe was sometimes difficult, and I ended up shooting some pictures in “External Auto” mode without even knowing it – well, I found out looking at the display, they were all badly underexposed because the strobe and therefore the in-built sensor was not pointing straight at the object I was trying to get a picture of. Backscattering was an issue due to wrong placing of the strobe at times (as on the cuttle fish image in this paragraph), and at times also hard to avoid. And it took me a few tries to remember that the “slow synchro” option was still programmed in my custom wide angle setting C2 – instead of allowing non-existent ambient light through the lens before firing the flash I could see my red modeling light which only turns off immediately before the flash fires. I was shooting a lot of pictures of small cuttle fish, and the macro setting C1 described on my camera setup page in combination with the S-TTL-low mode did a decent job. Shutter speeds were standard 1/60s. The thing to do for me are further some more dives during the day to practise the strobe placement and becoming more familiar with the different options of using the strobe. 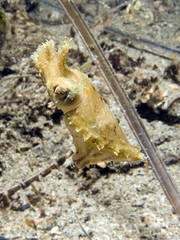 This entry was posted on June 4, 2008 at 3:41 pm and is filed under Divelog, Diving in Sydney, Underwater Photography. You can follow any responses to this entry through the RSS 2.0 feed. You can leave a response, or trackback from your own site.